"Created by NYC design strudio Commonwealth- aka Zoe Boira Coombes and Francisco David Boira- the platinum covered, porcelain vases in the Vaas series glow with a reflective, lunar-like surface. 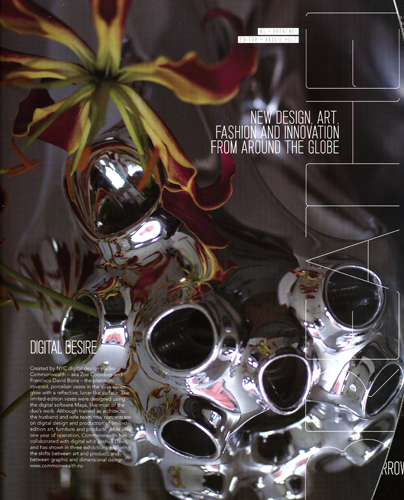 The limited-edition vases were designed using Maya, an animation software. Although trained as Architects the husband and wife team now concentrate of the design of limited edition art, furniture and products. After only one year of operation Commonwealth has collaborated with digital whiz Joshua Davis and shown in three exhibitions exploring the shifts between art and product and between graphic and dimensional design. " -Kellie Holt. 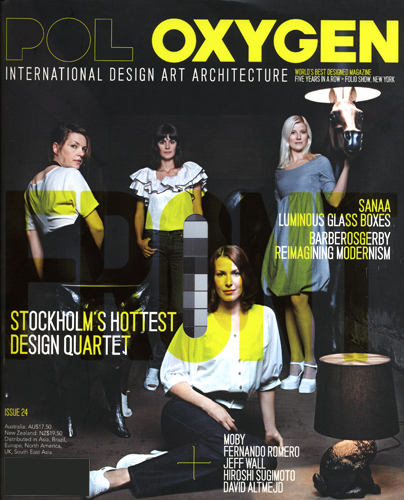 for POL Oxygen Magazine. August 2007.